PACKAGING: Card backing for scissor is chosen at random among the 5 colors shown. You will not be able to choose the color you get. Introducing the first pair of scissors in our new Kreative Snips line of carefully curated collection of scissors for all your embroidery, tailoring, dress making, and paper cutting needs. Each one of our scissors are guaranteed to be cute, stylish, and yet functional. 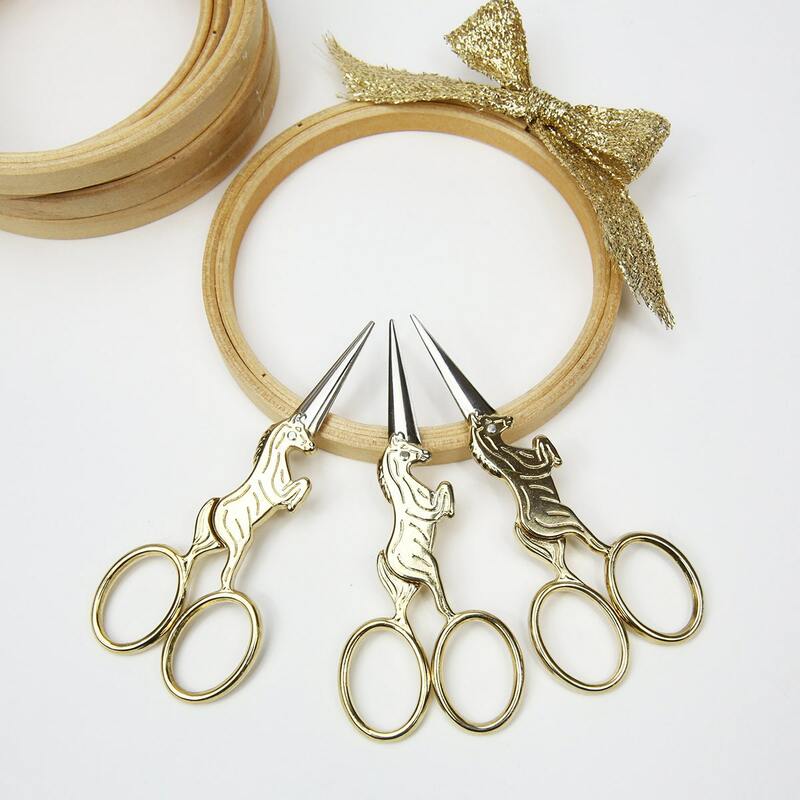 The unicorn scissors are currently the hottest pair of embroidery scissors on the market. They're useful for your everyday stitching need but also make the greatest photo prop! Follow us on instagram and facebook where we'll announce new snips as they are added to the Kreative Snips collection. ALL OF OUR IMAGES ARE COPYRIGHT PROTECTED. PLEASE DO NOT USE OUR IMAGES WITHOUT OUR WRITTEN PERMISSION. Please see our shop policies for more information about our felt before purchase and for purchase terms and conditions. *	We try our best to represent the colors of our products as accurately as possible but appearance of color may vary between computer monitors. All purchases in California are subject to sales tax at the applicable rate. Most items can be returned within 14 days of receipt. The following items CANNOT be returned: custom listings, fabric, bias binding, felt backed fabric, ALL ribbon (felt, velvet, cotton, polyester, etc. ), DIY kits, all sale items, and all items that have a special notation on the listing description. If you are not clear if an item qualifies for a return, please ask us before you make a purchase. Qualifying returns must be in "sellable" condition - no marks, no wrinkles, no dirty fibers. Please make sure clear plastic bag used to ship product to you is used to ship the return merchandise as that that will ensure it stays clean in transit. We cannot accept returns if is has been around any pets. Unless there is a defect in the material we sent, customer will be responsible for the cost to ship the merchandise back and refunds will be issued for the actual merchandise itself. There will be no refund on the shipping. Please contact us at customerservice@thefeltpod.com for information regarding the return process. Current shipping time varies between 1 and 4 days, depending on the order load. If you need something by a certain time, please contact us before you place and order to see if we can accommodate. All shipped orders will receive a tracking number. We ship through United States Postal Service (USPS) First Class Mail and packages usually arrives in 3-4 days after item is shipped. Packages weighing more than 1 pound will automatically ship out via Priority and should arrive in 2-3 days. If you need to receive your order by a certain time, consider upgrading the shipping method to Priority 2-3 day or Express 1-2 day delivery. Just shoot us an email and we can bill you the difference. The only service providing a guaranteed "deliver by" date is USPS Express delivery. If you would like to insure your package, please let us know so we can add this additional service and charge you accordingly for the additional cost. We are not responsible for packages lost by the USPS or for delays caused by USPS. An email will be sent to you with the tracking number once items have shipped. International orders are shipped using USPS First Class International mail but the time of arrival is not guaranteed. We are not responsible for products that do not reach you and buyer is responsible for all custom charges. We will provide you a tracking number but there is no real way for you to track package because postal carriers are not required to scan in First Class International packages. Essentially, the tracking number just lets you know that we shipped your order but does not provide you any additional information as to the whereabouts of your purchase once it has left our hands. In most cases, the products do arrive at the intended destination, but it is possible that the package is lost in transit. If you don't want to take any chances, you may choose to upgrade the shipping to Priority and add insurance but keep in mind that this may add a substantial cost. International orders may be subject to customs duty. Buyer is responsible for determining those charges. Seller will not be responsible for any fee/customs/duty imposed by your government. Currently we do not ship to Italy due strict custom regulations. Technical information regarding our wool felt rolls, sheets, and ribbon only. The Felt Pod is not liable for what you do with the felt and who you sell your items to. We are not responsible for any imperfections, damage, or casualties that result from the use of our felt. Purchase of our felt means that you are in agreement with our terms and conditions.